We’ve launched a new brand, a new identity, and a new focus- e-learning. That’s right, in fact it’s nothing new to us, we’ve been doing it for over 10 years and we’ve gone full time with Lucid Way over 3 years ago. The difference now is that it’s all we do now. Sure we’ll be developing websites and e-commerce functionality, but we’ll be doing it for e-learning applications. Check out our promotional video below. Our excitement revolves around responsive design. In fact, just do something for me right now – resize your browser window really small and watch what happens to the Lucid Way website. Now that’s responsive design. In another post, I’ll be talking about how it’s done and why we did it but for now just know that it’s a game changer in more ways than one. 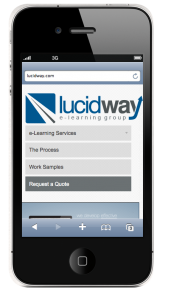 Our real focus, e-learning and mobile learning will benefit from responsive designs, and the market (including us) we predict, will respond with some really cool products for e-learning training. We hope you love our new website. We are working on getting some more samples up on the site. We’ve done a lot of projects through the years and we have to be selective. So, stay tuned for some tutorials and other e-learning goodies. Don’t forget to follow us on Twitter for the latest blog posts.